The stop motion animated series featuring the beloved Rilakkuma character comes to Netflix as an original series next year spring time. Rilakkuma is a mysterious bear who turns up to live with Kaoru, a seemingly ordinary young woman. Besides Rilakkuma, Kaoru also lives with Korilakkuma (a small white bear cub) and Kiiroitori (Kaoru's pet bird), and they have adorable, surreal, and amazing adventures together. Watch the teaser trailer available for viewing below for a very early look at the cute creatures of Rilakkuma and Kaoru. Created by San-X, Rilakkuma is one of Japan's most beloved characters. Netflix has teamed with dwarf, Japan's leading stop motion animation studio, to bring the franchise to life in stop motion for the first time. 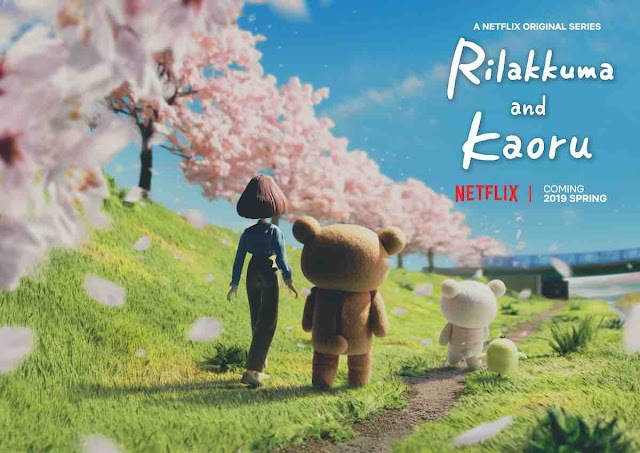 The key art reveals a first look at Kaoru, Rilakkuma, Korilakkuma (a small white bear cub), and Kiiroitori (Kaoru's pet bird). Catch more about the show here.